BACKGROUND: You have already demonstrated your design skills in creating a Book Cover Design, a Design for a Block of Stamps and small business website. Now, you are going to demonstrate all of your design and Photoshop skills on yet another Practical Design Application Project: "The Movie Poster." THE MOVIES: You movies are listed below, you will be able to select the one that sounds interesting to you. Please select a film with which you are NOT familiar. THE POSTER: You will be creating what is known in the industry as a teaser poster or advance poster. These types of posters are early promotional pieces, containing a basic image or design without revealing too much information about the plot, theme, or characters. The purpose is to incite awareness and generate hype for the film. A tagline is included to give the viewer a hint at the type of film being produced. Sometimes, teaser posters are issued even before a film goes into production. Because this is a "Teaser Poster", you will NOT be including any stills or images from the actual poster, as that is not available at the time Teaser posters are created. Your design will need to include generic/general graphics and imagery that matches the theme and plot of the film. Main Actors: For use in the "Film Information" section at the bottom of your poster and possible inclusion in the graphics of your poster design. In IMDB, actors are listed in billing order, most important at the top of the list. You need 1-3 actors to list on your poster. Tagline: The "catch phrase" of the film, for use in the graphics of your poster. CREATING YOUR POSTER: You will be creating your poster on a vertical (8.5 inches wide x 11 inches high) or a horizontal (11 inches wide x 8.5 inches high) canvas in Photoshop. I am looking for your very best work of the year! I want to be amazed by your work, so get crazy creative and make something extraordinary! Film Title: Using your Typography skills and any fonts that you wish, create a FILM TITLE for use in your poster. I highly recommend using strong colors and strokes that attract the eye of the viewer. DO NOT copy the original movie title! Tagline: The tagline or "catchphrase" is meant to increase the interest in the mind of the viewer. IMDB lists the taglines of most films. You can use the official tagline of the movie or create your own. Place the tagline in a prominent, easy to view area of your poster. If IMDB does not list a tagline for your film, you will need to create your own. Actors: If your film includes big name actors that might draw fans, consider listing them prominently on your graphics. If not, include the actors in the INFORMATION section, below. 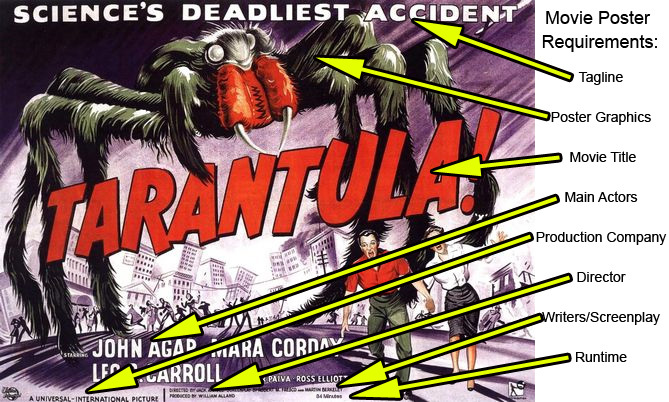 Movie Information: The Director, Writers, Production Company and Runtime should be included in small, but readable letters on the bottom of your poster. As best you can, try to copy the look of this section of a movie poster from the sample movie posters in the gallery. PLEASE NOTE: I would like to see students using only "clean" photographs and graphics for their posters. All graphics and special effects on your poster created by YOU! I would even encourage students to use a camera to photograph their own graphics, whenever possible! WRITTEN REQUIREMENTS: Ordinarily, a Graphic Designer would be required to present their work to their client and explain their design decisions and how they enhance the message of their work. You will do the same, but in writing. Click over to the Graphic Design Movie Poster Presentation and fill out the form to explain your work when you are done creating your poster. Make sure you complete the Graphic Design Movie Poster Presentation. Part One: Proper inclusion of all required elements. 100 points. Part Two: Graphic Design appeal. This will be completely subjective grading on Mr. B. 's part. How GOOD DOES YOUR POSTER LOOK? 100 points. Part Three: Written Presentation with the Graphic Design Movie Poster Presentation. 100 points.